They say charity starts at home. I think the same has to be said for protecting your mental health. Statistically one in five young adults in Ireland are suffering from a mental health issue. If you think you are one of these who suffers, use 2015 as the year you fight back against it, and picture yourself this time next year looking back with a sense of achievement and pride that the real happy you has resurfaced. And don’t worry, it’s not an all or nothing list. Even if you take one or two, incorporate them into your life and see if you notice any difference. I’ve put this first because it’s my personal favourite. Admittedly I would be quite body conscious and I believe that a healthy body for me equals a healthy mind. However this isn’t the case for everyone. But even if it’s not, exercise is still key for fighting away stress. When I exercise, I feel like I’m pounding stress away with every stride of a run or every push of the pedal. So this January why not give it a go? 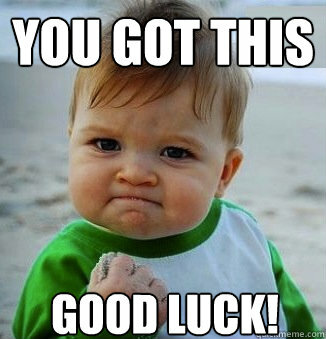 Look up a ‘Couch to 5k’ programme, join a walking group, or retrieve the football boots from the shed. If you find out that “nah, it’s not for me“, then so be it. If I was me 2 years ago, and in your place and reading this blog THIS is where I would say “pfffft” and just stop reading. “Meditation is for weirdos, and old people. And I’m neither of those.” That was me knocking something before I tried it. Meditation has the power to take you away from yourself and let you see your own life from a different perspective. It can relax every muscle in your body, including your brain. It really is astonishing if you give it a chance to be. It’s simple and will only take less time than one episode of Friends. Just go to a quiet room in the house, log on to YouTube, type in guided meditation, stick on the headphones and you’re away. For example one of the guided meditations that I have used is this one on ‘Motivation’. I know you might not think this is for you. But just give it a go and make an informed decision on it. Any lads who still aren’t convinced.. Colm Coyle, our GAA club manager (the same Colm Coyle who’d eat anyone alive during his playing career while collecting All-Ireland medals with Meath) took us through guided meditation in the dressing room before our championship semi-final and final this year. Maybe it had no effect. But we now have the medal in our back pocket so it definitely did no harm. Ughh… Do we have to. NO you do not have to go on some stupid supplement diet to try and drop weight in 9 days. Where’s the good in that? Instead, make small changes. If you get a Chinese once a week, push it out to once every two weeks and relish it more when it comes. Stop having sugar in your tea. Buy meat in a butchers rather than eating it from a packet. Think of what small affordable changes you can make, and make them. Once they are conquered, make more. This time next year you will be stuck in a fantastic habit of eating well. But will this have a positive effect on my mental health? Yes, yes it will. 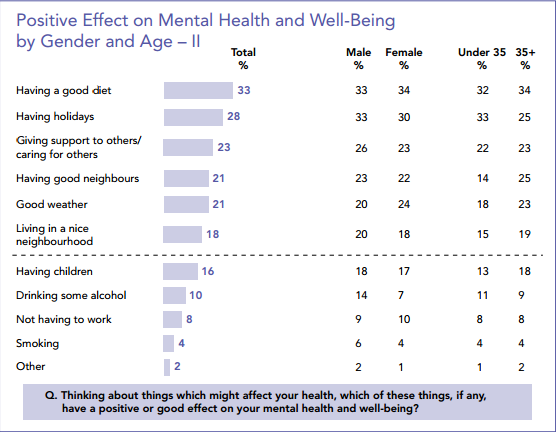 This graph from the HSE’s ‘Mental Health in Ireland: Awareness and Attitudes’ guidelines shows how important having a good diet is considered to be. One little tip however. Don’t put yourself under stress trying to cut something out of your diet. You’ll know when you really need a cheat day, and when you do, take it. A problem shared is a problem halved. And it really is. I get pissed off watching films, where the ‘macho’ man won’t tell people he’s in a bad mood. Instead he’ll go break open a bottle of bourbon and contemplate life in a dark room. This does not work. The same way a bus can’t jump over missing piece of motorway in Speed, or the same way Liam Neeson is still alive in Taken. Going into a lonely shell is not a solution. For any of us lucky enough to have caring family and friends, use them. Don’t be afraid to share what you’re going through with them. If you do not have this novelty, or you feel too embarrassed to talk to them, you’re not alone. So many people feel like the world is against them and that there is no one to turn to. But there is. This year, pick up the phone, flick on the kettle, take someone for a walk and SHARE what you’re going through, once a day/week whatever and prepare to feel the weight lifting. Happy New Year one and all. And good luck with your resolutions. Very well written piece. Thank you! No problem Paddy. Glad you like it.